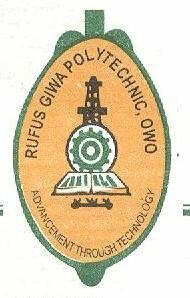 Rufus Giwa Polytechnic, Owo (RUGIPO) Matriculation Ceremony Dates, Time and Venue for Freshmen, 2018/2019 Academic Session Out. Venue: Rufus Giwa Polytechnic, Owo (RUGIPO) Auditorium. Also Read: RUGIPO Academic Calendar Schedule for 2018/2019 Session. Please all guest are expected to arrive the venue and be seated on or before the commencement of the matriculation ceremony.